The incident took place ahead of the Assembly elections in the state. Police seized Rs 5,80,6500 from car on Monday night. Photo Credit: ANI. 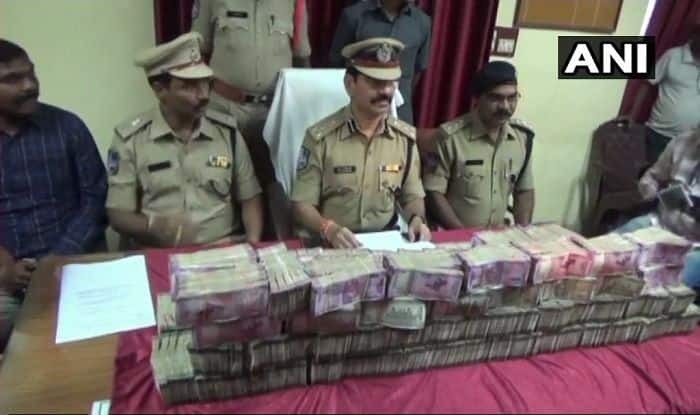 Hyderabad: The Telangana Police has confiscated unaccounted cash amounting to Rs 5.8 crore from a car from Pembarthy check-post in Jangaon, Warangal. The incident took place on Monday night, ahead of the Assembly elections in the state and a case has been registered in this regard. According to a report by News18.com, Warangal Commissioner of Police V Ravinder said that a Hyderabad-based businessman had allegedly transferred Rs 1.5 crore to Nama Nageshwara Rao, Rs 2 crore to Vaddiraju Ravichandra and Rs 2.3 crore to Konda Murali. The three people, along with the car driver was arrested by a sub-inspector from the Janagoan police station who also seized Rs 5.80 crore. Police stated that the accused were travelling with the money from Warangal to Hyderabad. The businessman who belonged to Goshamahal area in Hyderabad had sent the cash which was meant for three politicians from TDP and the Congress, said a report by The Republic. The businessman was well known for investing in shell companies.